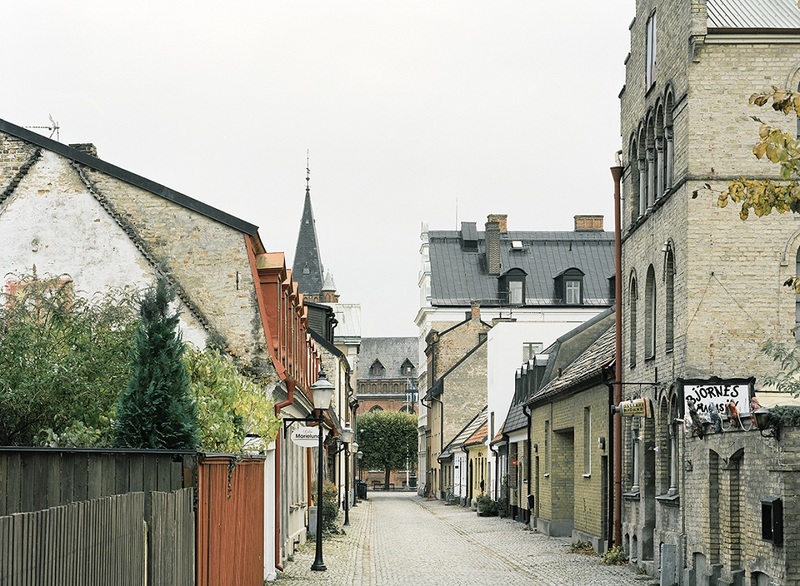 Most of the residential architecture in coastal Landskrona, Sweden, is quaint and unassumingly beautiful. For a long time there was an empty lot only a bit wider than two dozen feet on a dense street in the center of town. 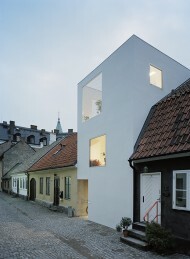 One day, a stark white townhouse appeared on the block, boasting elegant geometrical proportions and a transparency that commands a place in the heart of art and architecture enthusiasts. What happens to a traditional streetscape when distinctly different, yet equally gorgeous, architectural styles are juxtaposed? Jonas Elding and Johan Oscarson of Elding Oscarson architecture of Sweden wish to reveal a few of their design secrets. The materials, an innovative mechanical heating and cooling system, a moss-sedum roof, natural lighting design, and the use of an existing lot within a dense urban context are all key green elements of the home's design. "We believe the best green concept about our building is the fact that its design exemplifies beauty; so it is durable simply because it will always be a desirable building within Landskrona," says Oscarson. Still a concept that has not fully infiltrated the minds of the public about green design is the idea that durable buildings and interior finishes generate less waste over time. If we do not need to tear down and to rebuild, then we are saving the planet far more than we would be using any other ingenious green design tactics. In order to create an energy-efficient envelope as well as to provide sufficient fire separation between the new building and its neighboring residences, Elding Oscarson chose a clay block material called LECA masonry for the exterior walls. LECA clay block is a low embodied energy material, is relatively inexpensive, is lightweight (cutting additional labor costs), and has a high insulation R-value. Clay block, no matter the specific material type, provides an ideal interior humidity level, thereby achieving optimal human comfort. Because of these advantages, clay blocks are gaining popularity throughout the world, particularly in China and in France, where many specific studies have been conducted in the past decade. 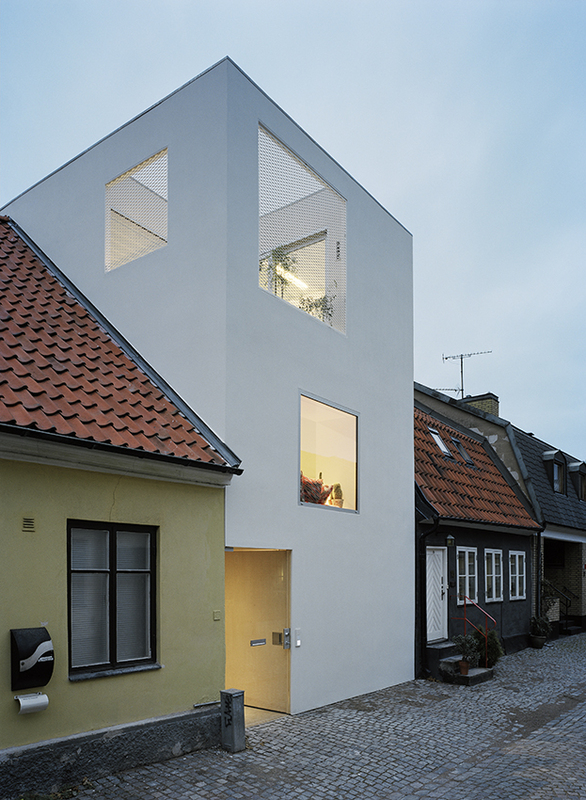 Poetically, the Landskrona Townhouse's geometrical composition references the other traditional buildings along its streetscape. The gabled roof houses across the street have the same roof height as the new white residence. 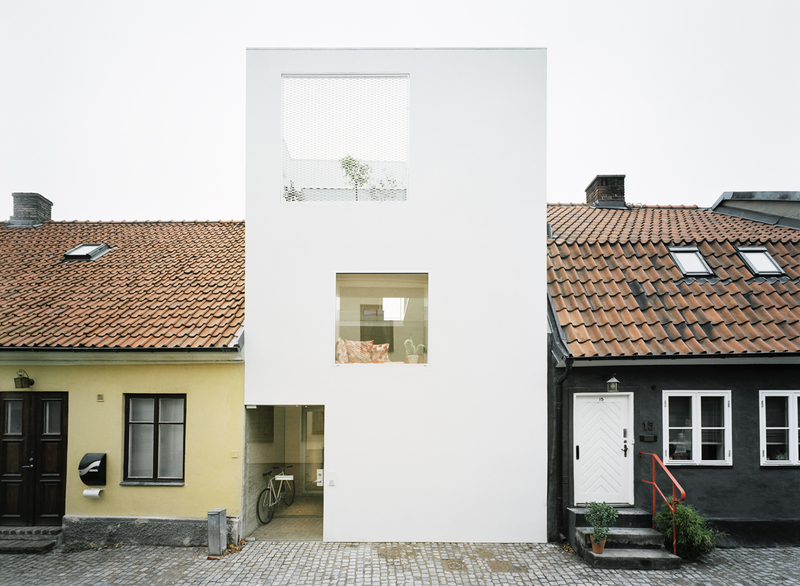 The windows and the front door also mimic the other clean geometries of neighboring homes. So, while the home appears to stand out in the crowd because of its differing building style and its bold color, it actually blends into its urban landscape compositionally. "There are no other buildable plots on this street, and getting a permit to demolish any of the existing buildings would not ever be permitted. So there is no way in which the street will transform; it will always be a street with old buildings," says Oscarson. 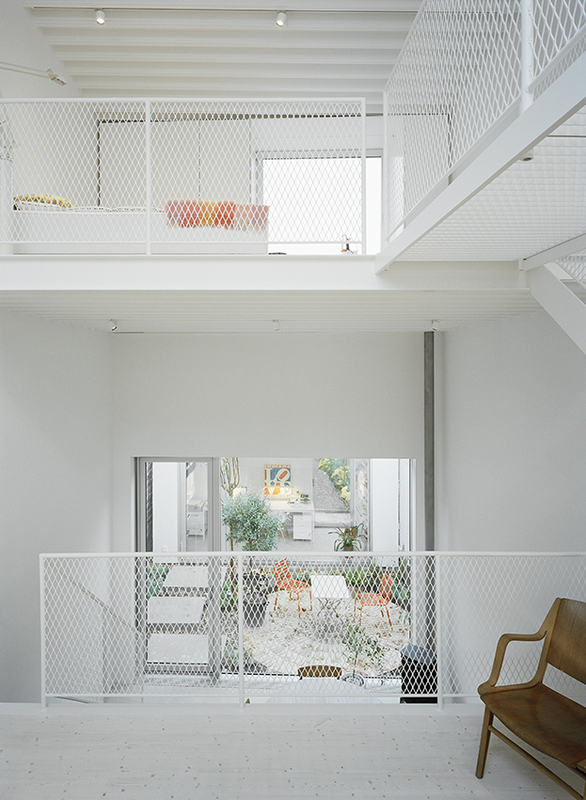 The home's gleaming white exterior walls mimic the interior courtyards of the urban landscape in which it resides. 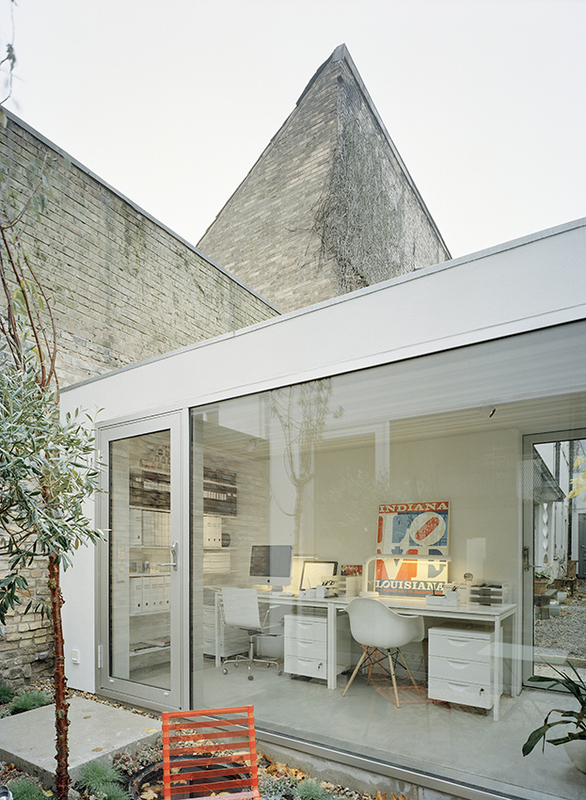 Indeed, the fact that the exterior walls are smooth and white is a reflection of the intimate, private spaces found within the center of the city block. Metaphorically, it is as if the courtyards are spilling out into the street through this new home, or that the courtyards are turned inside out and put out front for a public display on the street. 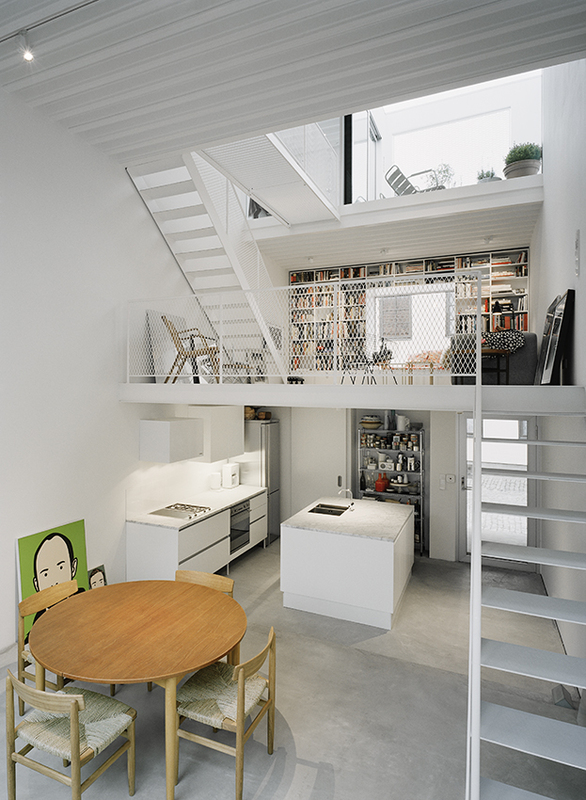 How can anyone design a gorgeous home which is only 750 square feet? Elding Oscarson saw the spatial limitations as a challenge to create a residence that is both ingeniously designed and irresistible at the same time. Admittedly, their greatest challenge on this project was to create spaces that flowed together while providing enough square footage for each activity that needs to take place within the home. The wide-sized exterior block and the mechanical system, which has a large amount of piping, made the challenge even more intense. 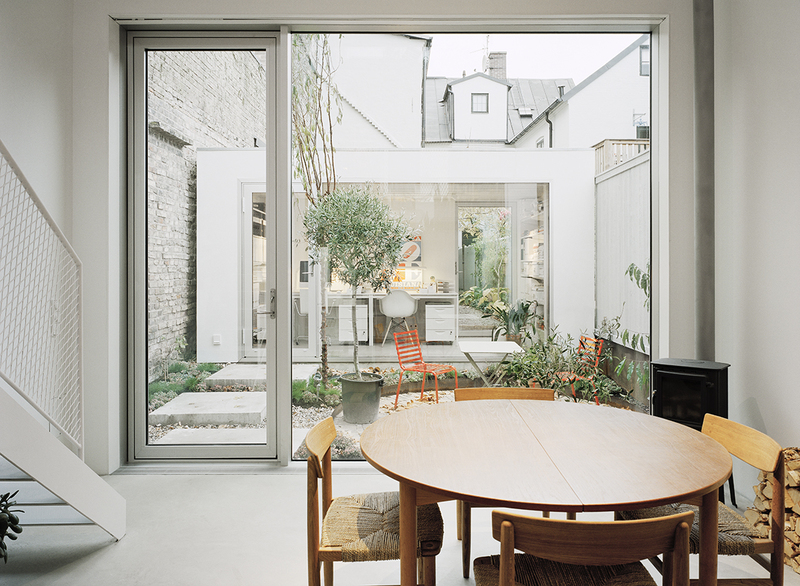 Creating a transparency throughout the building, from the streetscape's entrance through to the courtyard in the rear of the building, is one of Elding Oscarson’s strategies to make, "the best possible spaces we could with a minuscule site." 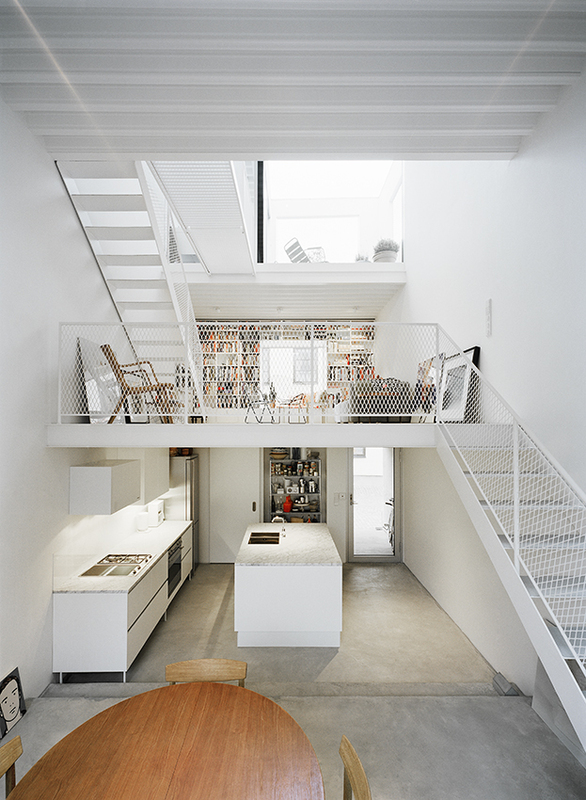 In particular, this is a design strategy that makes the spaces seem more expansive than they really are. Transparencies from the ground floor through to the upper levels are achieved by using steel grate flooring and stair tread materials. 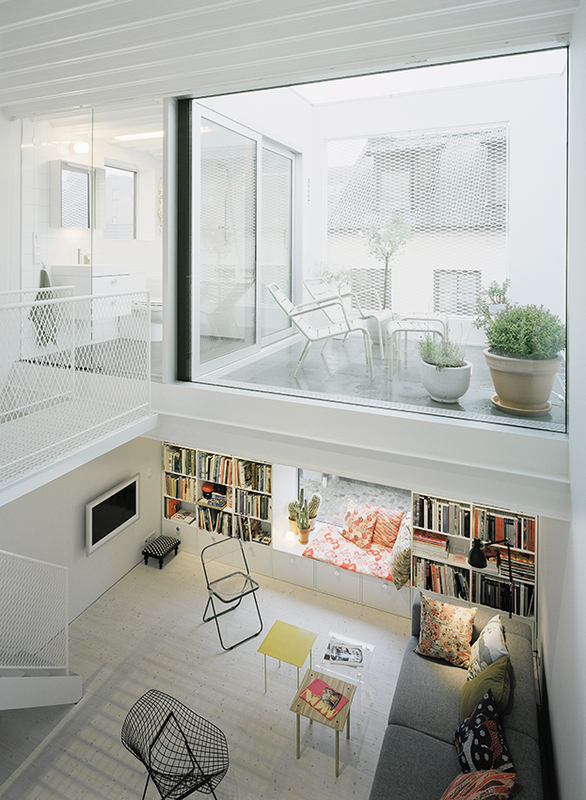 More obvious is the use of large expanses of glass that are aligned to give sight lines from the street through to the courtyards in the rear; some parts of the home are therefore open for display. Indeed, "it is a very bright house in a dark country," says Oscarson. Jonas Elding and Johan Oscarson opened their office with collective experience covering both Swedish and international architecture, from museums to private houses, interiors, furniture, and product design. Jonas Elding was an associate at Kazuyo Sejima and Ryue Nishizawa (SANAA) in Tokyo for seven years, during which time he led the design for the New Museum of Contemporary Art in New York City. 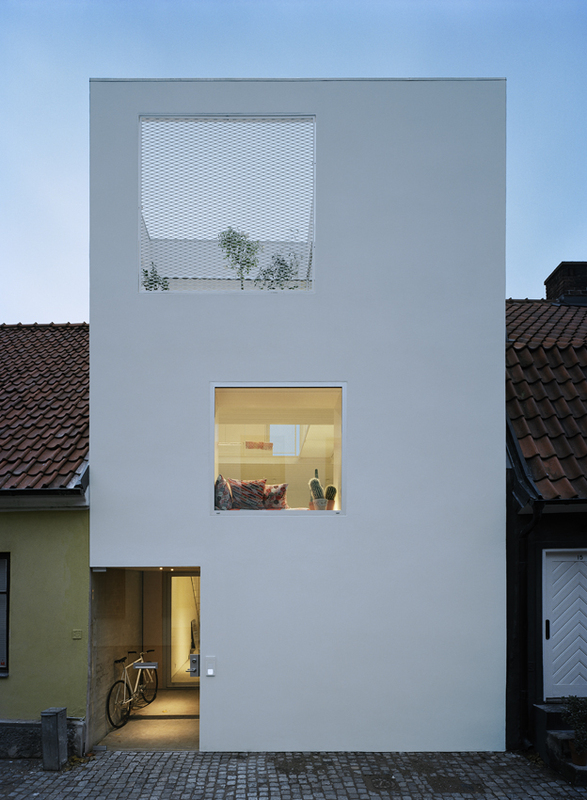 Johan Oscarson was an associate at Sandellsandberg in Stockholm for seven years, and led the designs for Villa Nilsson and the interior for the OMX headquarters. According to the architectural firm of Elding Oscarson, their "aim is to challenge a variety of architecture and design tasks and by means of a solid process find new solutions, ways to live, or atmospheric qualities. We look forward to leading a pragmatic work-flow influenced by site, program, budget or other parameters, making every project unique, real, and story-telling." 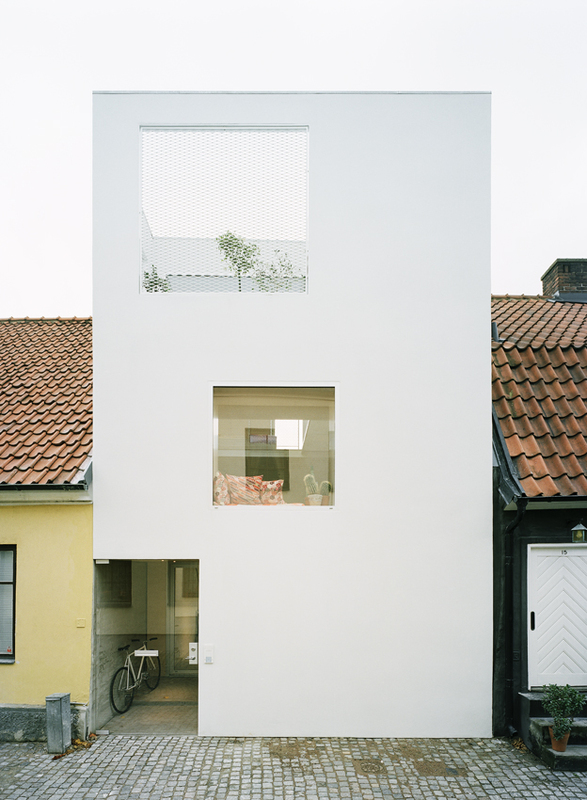 The Landskrona Townhouse is perhaps their first internationally recognized work as a new firm; "We started on this project in 2007, after I came back from Japan. Only Jonas and I worked on this project. At the time we had no other staff, except some help with model building. It might also be of interest that the little stackable sofa table is an Elding Oscarson design, and many of the Japanese pillows are handmade by my Japanese wife's mother from fabrics we picked together in Japan," says Oscarson. When the clients bought the slice of land for their new home, they had to also purchase many of the buildings across the backyard, facing the street on the other side of the block. They still own those houses, have created a tiny storage space in the courtyard, have rental space for boutiques facing the other street, and manage two rental flats. Regarding the courtyard, "it all feels very warm and close, and the relation to the backyards have been key to the project," says Oscarson. The clients work in the neighboring city Helsingborg (just 12 minutes away by train); one of them runs a café, and the other is a retail specialist and shop interior designer. They don’t have a car. The café-owner is starting up a side business in the house that has to do with art dealing, hence the little home office building in the immediate backyard. 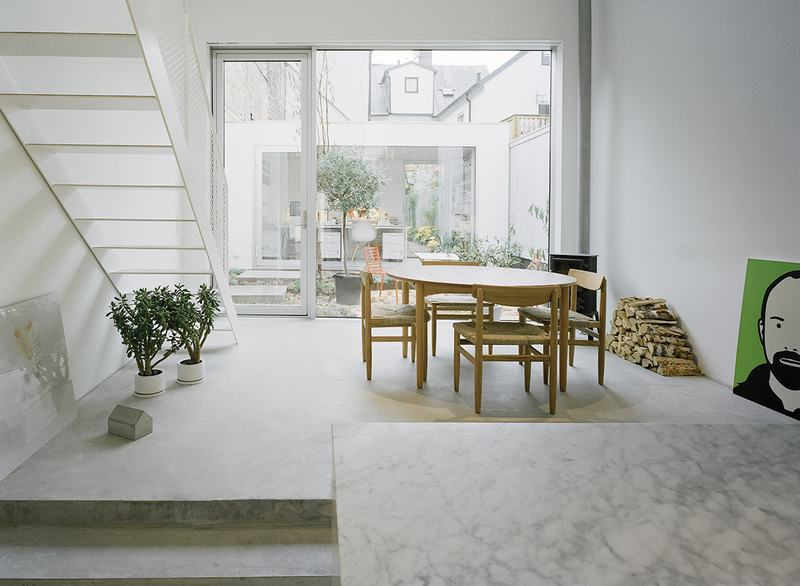 The couple plans for the home to be a private gallery, thus the white washed interior walls. "The organization of this house is tailored for our clients as compared to growing families; our clients have a very static family-constellation ahead," says Oscarson. 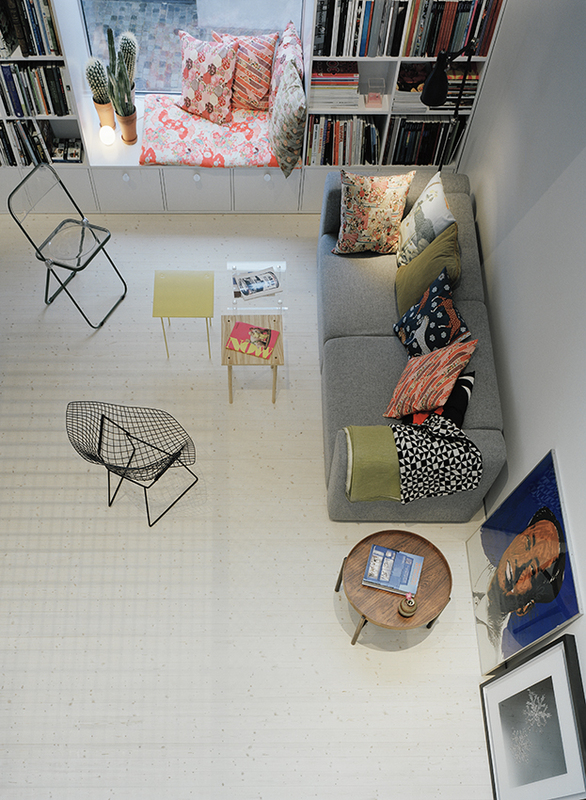 The crux of the spatial design is taking one large space and dividing it into "smaller, softer spaces." The clients plan to dwell in this home for the long haul. Rather than designing a home by generic residential design studies, "we designed the home to be inventive and highly unusual," says Oscarson. 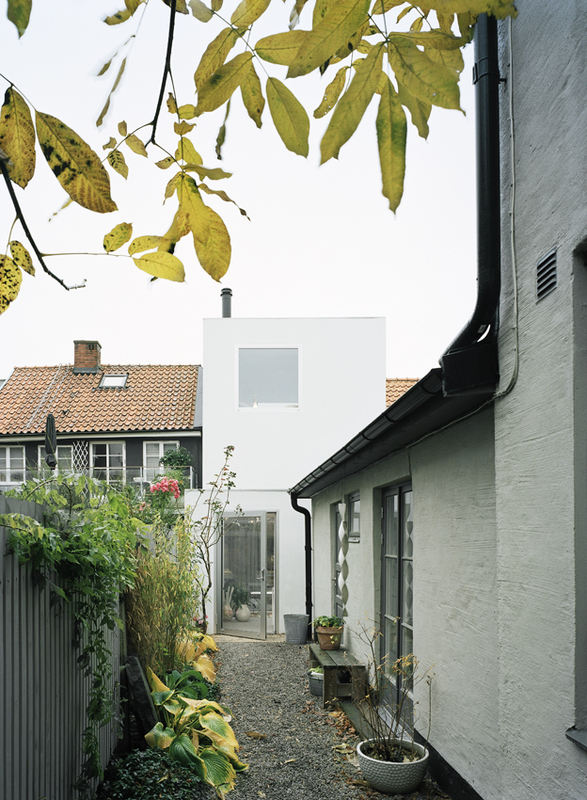 By recycling the heat of the expelled air through a heat exchanger, the Landskrona Townhouse beats Swedish energy consumption regulations, which are perhaps the most rigid energy consumption regulations in the world: as of 2010 all buildings in Sweden must meet the 55 kWh/m2 per year standard. 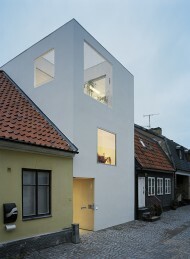 Coming in below this tough new standard, the Elding Oscarson townhouse consumes only 47 kWh/m2 per year. "Installing this recycling heat exchanger is not rocket science at all. However, it is an expensive add-on to such a small project. Likewise, finding space to add in all the big piping required for the system to function, especially in a house with such tight spatial constraints, was an additional challenge, design-wise," says Oscarson. The compressed, structural slabs are very thin and span five meters (without a supporting beam), while also containing a water-borne heating system within and supporting a solid spruce floor above. 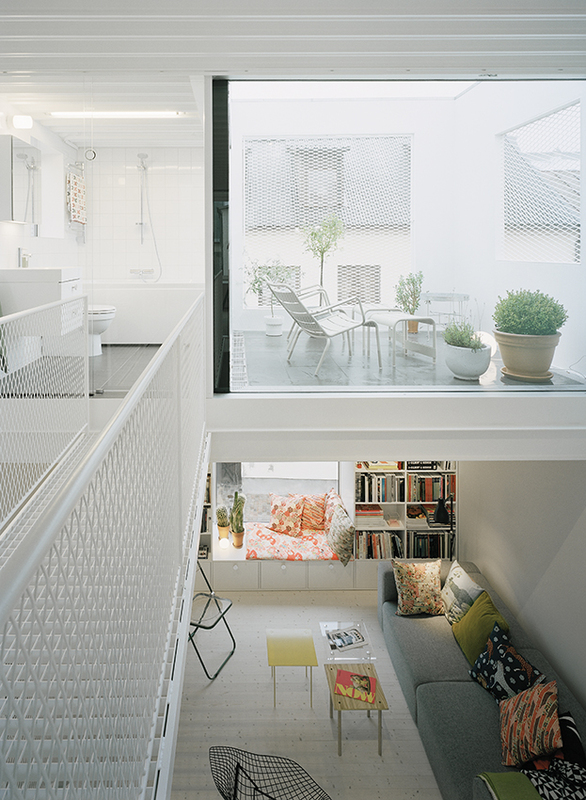 There are no visible shafts or exposed pipes throughout the building’s core, and concealing them within the overall design to achieve open space gave Elding Oscarson considerable difficulties. For example, there are pipes hidden within the window seating units. "It would have made sense to drop out some of the additional piping associated with the recycling heat exchanger system, but we refused to consider that as an option," says Oscarson. Perhaps the most amazing part about the home is the fact that its construction cost was quite low by European and Swedish standards. A primary reason for this is because the LECA masonry was chosen rather than steel or concrete for the main structural system. 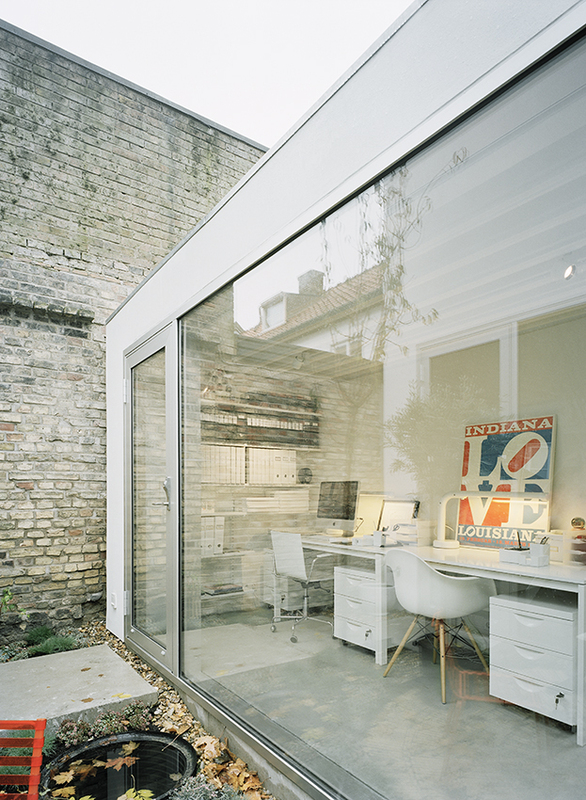 "Steel would have been too complicated for such a small space, and it can be quite expensive. Concrete may become expensive by way of labor costs," says Oscarson. LECA was an excellent choice because it kept labor costs down, was relatively inexpensive to purchase, and continues to provide cost savings to the owners via energy efficiency. "I took a new client to the home recently for a tour, at which time he was floored to find out the construction cost was 1/3 of what he had expected," says Elding. In the Landskrona Townhouse, it doesn't feel like you are living in a cold, dark country where the December days provide only a mere four hours of dusky light. From the rooftop courtyard to the large expanses of insulated glass windows, natural lighting permeates through the structure. 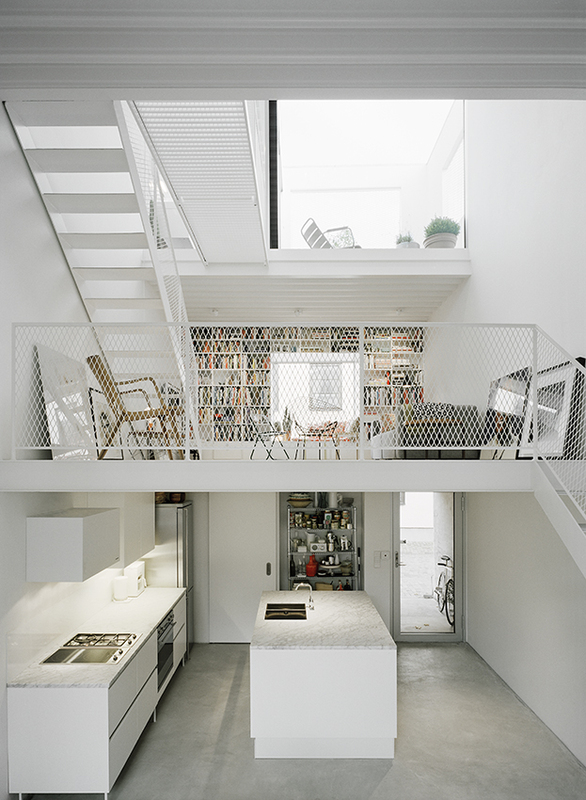 Not even the bridge on the third floor nor the stair treads impede the light that flows from top to bottom. The clay block, recycled air heating system, and radiant floor heating all provide the ideal level of human comfort in regard to both heat and humidity. 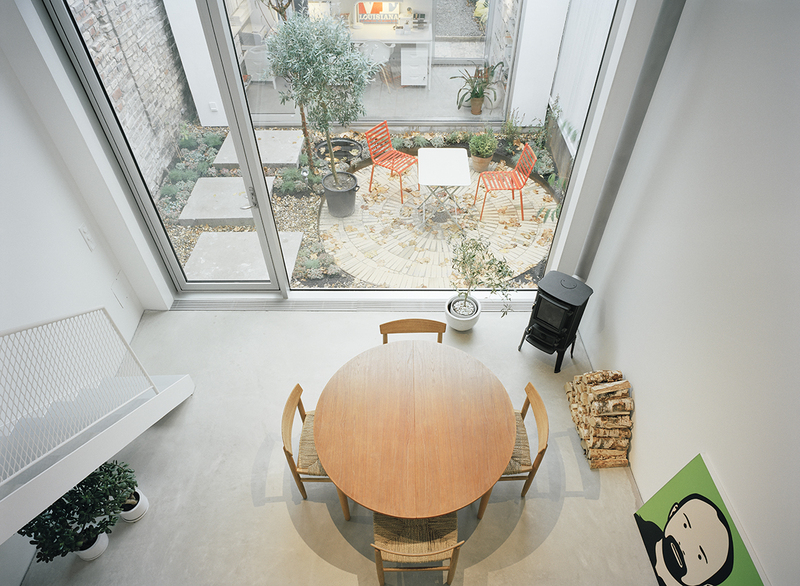 The transparency throughout the home allows the occupants to feel as though they are very much a part of their urban landscape and as well as a part of nature from the glass between the bathroom and the rooftop terrace to the visual connection between the dining room and the backyard courtyards. In many facets, the home makes a bold statement about sustainability, building costs, geometrical proportions, and designed transparencies on an elegant traditional street in a small coastal Swedish town. Stephanie, an NCARB registered architect and LEED AP, draws upon her studies in architectural history and theory from Sarah Lawrence College and her master’s degree in architecture from The Ohio State University. Providing copy for publications and performing marketing work for the construction industry, Stephanie works as an independent freelancer from Columbus, Ohio.